If you’re creating educational video courses for distribution online, and you’re looking for nothing more than a platform to release your content on, then Vimeo On Demand might have exactly what you’re looking for. Vimeo has traditionally been a place for filmmakers to upload and share their work, but recently Vimeo took their services a step further by creating a platform that allows filmmakers to sell their content online. Essentially, customers can watch trailers for films and then enter their credit card information right into the system for easy access to the content. However, when you visit the Vimeo On Demand homepage you’ll think this service is exclusively for filmmakers. Vimeo uses phrasing like “upload a trailer” and “upload your poster” and language that sounds directed towards filmmakers, not educators. SO WHAT DOES THIS HAVE TO DO WITH ECOURSE SELLERS? At first glance this service doesn’t seem to cater to the needs of eCourse creators at all. However, a quick search I found a category called ” instructional” where I found a small selection of educational material being uploaded that meets Vimeo’s content requirements. Edupreneurs are using the platform to sell their photoshop, guitar, kitting and magic classes online. Vimeo is a great company. We use them for our own services and we host all of the videos from our eCourse Astro School through our Vimeo Pro account. It should be mentioned that you need to have a Vimeo Pro account in order to qualify for Vimeo On Demand. However, if you qualify for the service, the profit splitting is very fair. They use a 90/10 split model with the content creator keeping 90% of their profits. The best news is that their pricing system is totally flexible. Some people are selling courses online for only $30. Others have the option to “rent” their courses for a certain duration of time for even cheaper ($2 – $3 for example). Then there are eCourse sellers offering very high quality, in-depth and feature rich courses that are selling for much more. Take a look at the animation course being offered for $350 below. 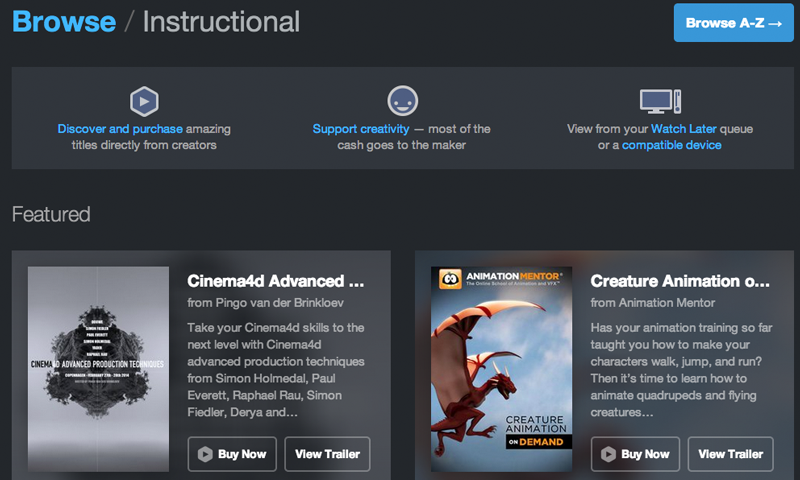 It’s going to be interesting to see where Vimeo takes this “instructional” category. It doesn’t seem to be their focus right now. I even found it a little difficult to find this page in the first place. However, I think they will quickly realize they have an incentive to try and recruit more online educators who would like to use their platform to sell courses online since many educational products have higher price points. Vimeo taking a 10% cut of a $350 e-course is much better than a 10% cut of a $10 documentary. Of course volume counts… but who says that eCourse sellers can’t out-sell filmmakers? This looks really interesting. 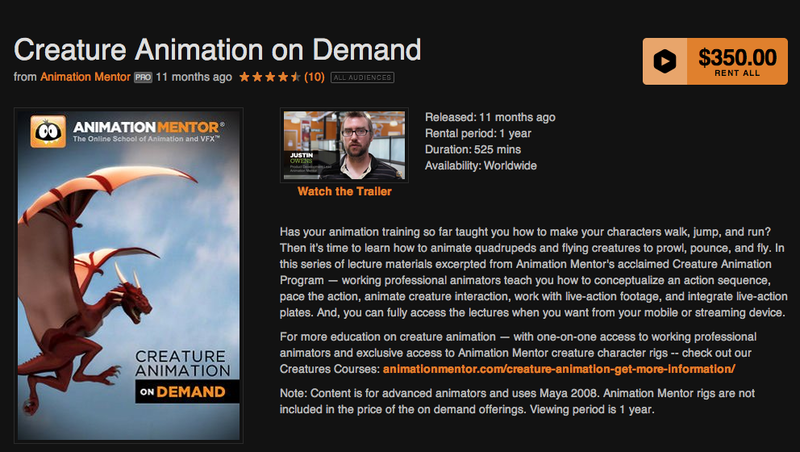 I knew about Vimeo but didn’t know about this VOD service and I would have never thought to use it for eLearning. I agree that this is really cool. I’m watching where this goes too.